What Is IRCE And What To Expect This Year? It’s one of the most unbiased retail and eCommerce events that focuses on the industry trends that drives commerce online. Every year, eCommerce experts and store owners fly in from all around the world to attend this grand event. 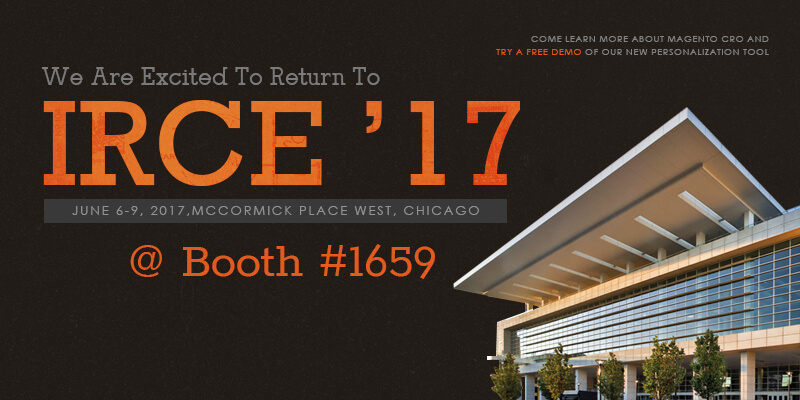 The IRCE 2017 is all set to take place in Chicago, June 6-9, at McCormick Place West. Internet Retailer is hosting some great workshops at IRCE 2017 to help eCommerce site owners take charge of their business. You can find the list of workshops and events planned by IRCE to help eCommerce owners overcome their online struggle. There are various keynote speeches that talk about the right technology investments that eCommerce owners need to make and how it impacts the customer’s buying journey. Learn about the need for personalization, mobile commerce, CRM, etc. to future proof your eCommerce business. Some of our best eCommerce experts will be at IRCE 2017 at Booth #1659. They have helped plenty of our eCommerce clients in improving their conversion rate drastically. Our personalization partner, TargetBay, will also demo their latest tool to help build user generated content and much more.We have proven expertise and solutions to optimize your eCommerce website to be SEO and CRO friendly. Our developers are trained to build a secured website that can help safeguard your customer’s critical data. So, beat the rush and schedule a time with us – We promise to have one of our best CRO experts waiting for you.